‘Sherlock’: “The Sign of Three” Review | Wait! What's A Dial? In run up to the wedding, we see that Mary doesn’t get between John and Sherlock. She goes out of her way to make sure nothing changes between the boys. It’s an odd dynamic, but it works. Mary knows Sherlock is afraid of losing his best friend. She also doesn’t want John to lose his. Sherlock and John need each other. Mary is happy to leave that arrangement intact and call Sherlock out on his lies, which is helpful. Let’s hope Mary’s around for a long time because she pushes John and Sherlock to take on cases when life gets boring. At the wedding, the happy couple is shown coming out of the chapel. The photographer wants to take a picture of Mary and John. Sherlock doesn’t realize he needs to move out of the way. It’s Sherlock being Sherlock. There was no ulterior motive. Sherlock is clueless about tradition and has paparazzi following him fairly often. Considering it was Sherlock, the mistake was forgivable. John and Mary probably saw it coming. Then, it was time for Sherlock’s best man speech. It was pure Sherlock. He showed disdain for tradition, admitted it was something he didn’t understand, and then made a genuine attempt to embrace something he only has a vague concept of. The man babbled about his life with John, tried to find funny stories, but all he ended up doing was taking out pieces of the puzzle that was sitting in front of him. The speech served as a way to flashback to two separate stories that were connected. We learned about the time Sherlock and John investigated a the stabbing of a Guardsman, which Sherlock couldn’t figure out. While Sherlock was trying to solve the murder, John realized the man was still alive and saved his life. The other story had the boys going on a pub crawl. Both men get very drunk, very quickly. From the time they left to the time Mrs. Hudson found them lying on the steps, two hours had passed. Since the pub crawl was a bust, they took up a case about a woman, who thought she dated a ghost. Sherlock lost that case because both men were very drunk. John kept falling asleep. Sherlock vomited on her rug. They ended up getting arrested and released by Lestrade, who found it funny. Who would’ve thought Sherlock would get arrested for something so silly? In spite of that bad start, the case led them to a support group for women with the same suspicion, which led them to a woman who somehow knew John’s middle name and about the wedding. This caused Sherlock to deduce that whoever was dating these women knew they worked for James Sholto, who was John’s ex-commanding officer and receives death threats because he lost a unit of young recruits. Sherlock realizes that someone is going to kill Sholto, who is a recluse and made a special trip out for this event, at John’s wedding. Fortunately, that doesn’t happen because Sherlock figures out that the cameraman put a stiletto knife into Sholto’s belt- having previously tested it out on the Guardsman. While Sholto considers committing suicide by taking off his belt, Sherlock talks him out of it. 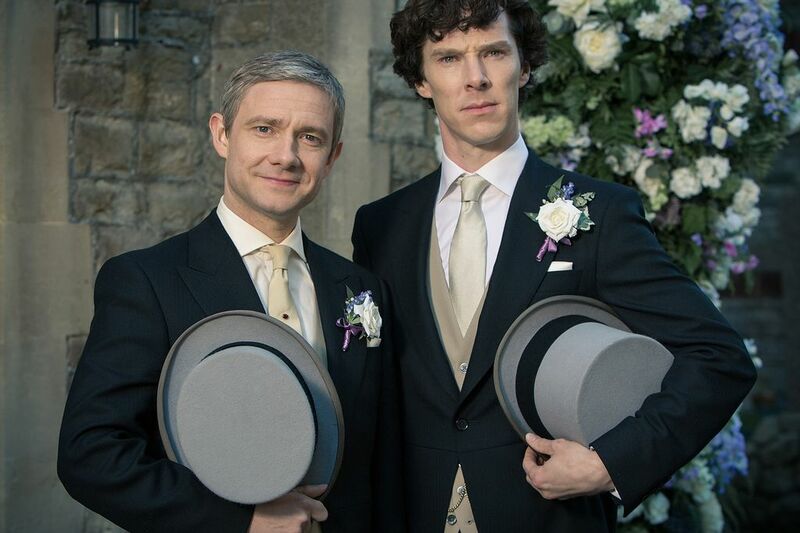 Both men are alike in many ways, so Sherlock pointed out that neither one of them would do that to John on his wedding. 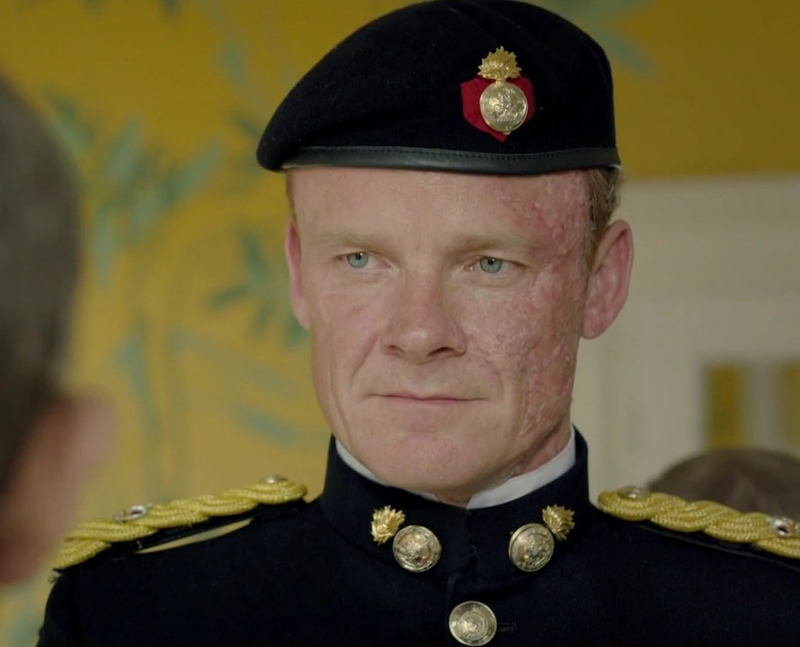 Sholto allows John to save his life. “The Sign of Three” is the first episode where Sherlock gets past his self-prescribed “high functioning sociopath” label and shows more than a passing glimpse of emotion. At the end of the episode, he tells John and Mary that they’re having a baby. She shows several signs, but no one other than Sherlock would’ve have put them all together. Once John gets passed the shock that Sherlock figured it out before an actual doctor, he doesn’t know how to take what Sherlock said. Sherlock tells the soon-to-be parents that they’ll be good parents. They’ve had plenty of practice with him. No matter what he puts John and Detective Lestrade thought, Sherlock proves at the end of the day that he’s a nice guy. He’s just clueless about human nature, which is why he needs John, and has an impressive ability to solve crimes. Posted on January 28, 2014, in BBC, British Television, PBS, Primetime and tagged BBC, bennedict cumberbatch, james sholto, john watson, martin freeman, mary mortsan, masterpiece theatre, pbs, sherlock, sherlock holmes, the sign of three, wedding. Bookmark the permalink. Leave a comment.